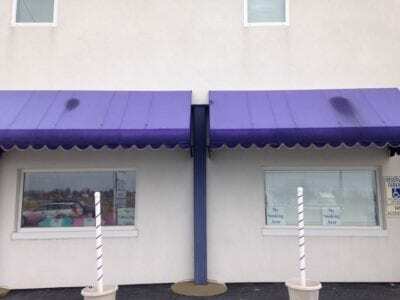 In addition to our various exterior cleaning services, Liberty SoftWash also offers canopy cleaning and awning cleaning to our commercial and residential customers in Central Pennsylvania including Lancaster PA, York PA, Harrisburg PA, Hershey PA, Litiz PA and surrounding areas. 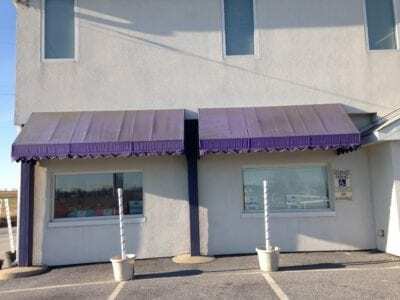 Often times, awnings are used as a way to increase your business’s curb appeal. They are used as signs to advertise business’s name or simply to protect patrons, window or your entire building front out of the elements. What ever their use, awnings and canopy’s should be kept clean and free from dirt, mold, dust, algae, bird droppings and other contaminants. After all, your awnings may be the very first things your customers see what impression do you want to give them. A dirty appearance of your awnings, windows or building exterior can create a bad impression for potential customers and may lead them to believe the rest of your establishment is in the same dirty condition. Liberty SoftWash can clean your awnings and make your entryway look inviting to both returning and potential customers. Your awnings will be cleaned using a solution that will eliminate any mold or algae growth and rid the surface of other contaminants. In addition to cleaning your awnings or canopies, your awnings should be treated every few years to help protect them from the elements and to maintain their waterproof protection. If this protectant is not applied, the UV rays cannot only break down the fabric and thread but also will allow for water to penetrate thru the canvas. Liberty SoftWash offers awning cleaning and canopy cleaning to both commercial and residential customers in Central Pennsylvania including York, Lancaster, Harrisburg, Hershey, Gettysburg and surrounding areas. Call the professionals at Liberty SoftWash to discuss your canopy or awning cleaning needs. (717) 324-4208.